Figure 1: Changes to the density of competitors is an example of environmental variability commonly faced by organisms in the wild. Environmental change is a common obstacle that animals have to overcome. Temporal or spatial changes in the weather, food availability, predator density, mate availability, or competitor density are just some examples of the environmental variability commonly faced by animals in the wild (Figure 1).The optimal phenotype (an organism’s morphology, physiology, behavior etc.) for a given environment often changes as environmental conditions change. For example, a caterpillar feeding on oak flowers will develop into a mimic of an oak catkin, while a sibling caterpillar feeding on leaves will develop into a mimic of a twig (Figure 2). These caterpillars may avoid predation by camouflaging themselves to match their environments. Develop to resemble oak twigs, (b) while spring broods feed on and resemble oak catkins (Whitman and Agrawal 2009). Figure 3: Hydrangea macrophylla flowers grown in acidic soil produces blue flowers, while flowers grown in neutral or alkaline soil produce pink flowers. If individuals are unable to adapt to changes in their surroundings, they may experience reduced survival or reproductive success compared to individuals who are able to adapt.Phenotypic plasticity is the ability to change behaviour, appearance, or other characteristics in response to environmental change. 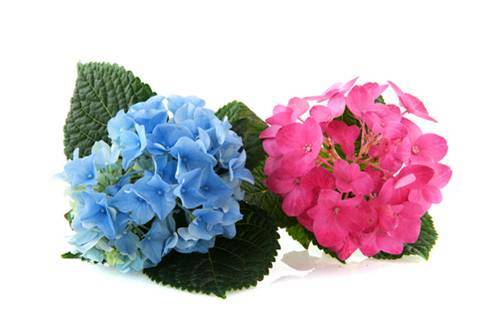 For instance, Hydrangea macrophylla produce either blue or pink flowers depending on soil alkalinity (Figure 3). Phenotypic plasticity may be adaptive as long as environmental variation is predictable and the benefits of plasticity outweigh the costs. For instance, phenotypic plasticity in sexually selected traits may be particularly adaptive if there are frequent predictable changes to the socio-sexual environment (e.g. fluctuation in mate density). In our study, recently published in PLOS ONE, we examined the phenotypic plasticity of male field crickets’ sexually selected acoustic signals for two species: the fall field cricket, Gryllus pennsylvanicus and the spring field cricket, G. veletis (Figure 4). Figure 4: The fall field cricket (Left- G. pennsylvanicus male) and the spring field cricket (Right- G. veletis male) are both found throughout North America. Male crickets produce acoustic signals by raising their forewings and rubbing them together, each closing stroke producing a pulse of sound with 3-4 pulses grouped into a chirp (Figure 5). These acoustic calls are used to attract females, and females choose mates on the basis of the quantity and fine-scale structure of these signals. Female movement and sexual receptivity in the wild often follows predictable fluctuations throughout the day (diel rhythms), which may partially be explained by hourly fluctuations in the biotic (predator and parasite density) and abiotic (light and temperature levels) environment. Therefore, males that synchronize their daily signalling rhythms to match female mating activity are likely to have higher reproductive success. Here we examined how male acoustic signalling in the laboratory changes over the course of the day and compared this to the known reports of diel rhythms in female mating activity in the wild. We captured wild males and brought them to our laboratory at Carleton University where we recorded their acoustic signalling for 2-4 days. We found that both spring and fall field crickets exhibited phenotypically plastic signalling behavior, with most males signalling more often and more attractively during the time of day when female mating activity is the highest in the wild (fall field cricket: night time and early morning; spring field cricket: early morning and afternoon). Most male crickets (from both species) chirped more often during the time of the day that female mating activity is highest in the wild (Figure 5). 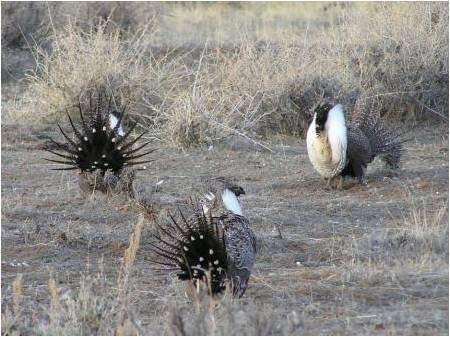 However, a few males of each species signalled in a seemingly maladaptive manner during times when female mating activity is lowest in the wild. Diel rhythms in signalling also differed across species, which may be beneficial in preventing lethal hybridization when spring and fall field crickets overlap temporally and spatially in mid-summer. Figure 4: Waveforms of long-distance mate attraction signals of one G. pennsylvanicus and one G. veletis male. Figures show typical long-distance mate attraction signal for each species and how signaling typically changes during time periods indicative of low (A & B) and high (C & D) mating activity in the wild. 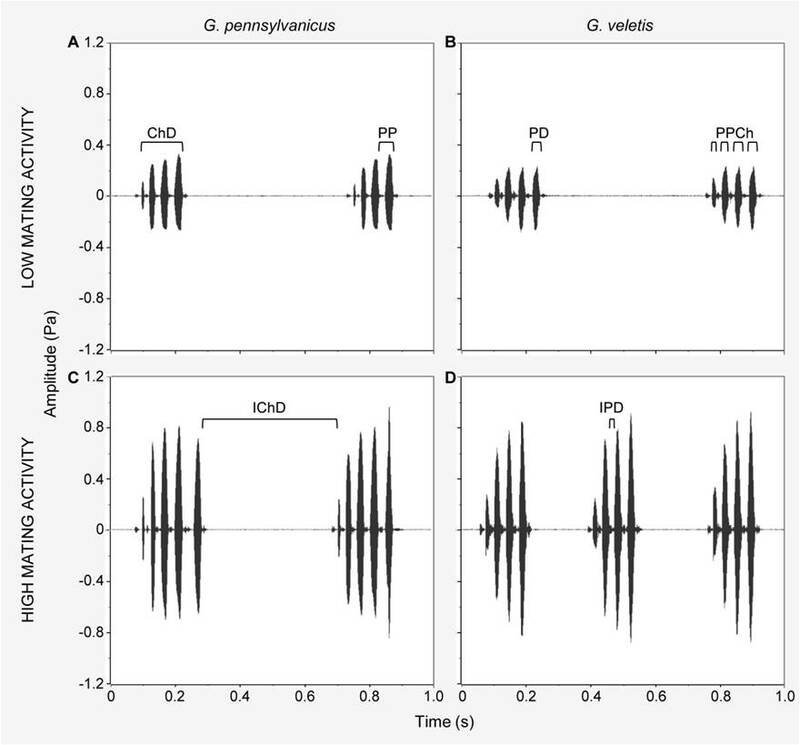 Signal fine-scale properties are indicated as follows: ChD = chirp duration; IChD= interchirp duration; PPCh = pulses per chirp; PD = pulse duration; IPD = interpulse duration; and PP = pulse period, which combines PD and IPD. Overall, our findings suggest that male field crickets exhibit phenotypically plastic mate attraction signals and that diel rhythms in these signals are synchronized so that they are in phase with diel rhythms in female mating activity, suggesting that signalling plasticity may be adaptive. We have yet to determine how the costs and benefits of the phenotypic plasticity we observed in our species of field cricket ultimate affect fitness.